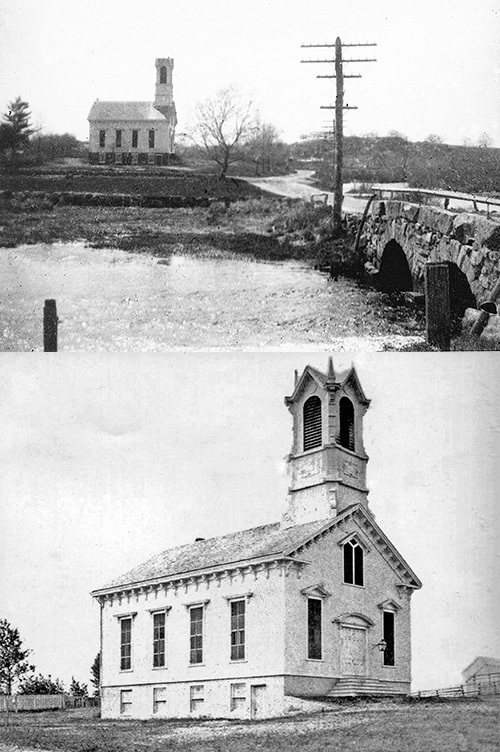 The Great Revival of 1842 in which hundreds of converts were baptized in the Mystic River swelled the walls of all the area churches, both Baptist and Congregational. Two hundred folks left the Second Baptist Church on Fort Hill to start Noank Baptist, and fifty more started Groton Heights Baptist in the city of Groton. There still remained 390 members in the Fort Hill Church! 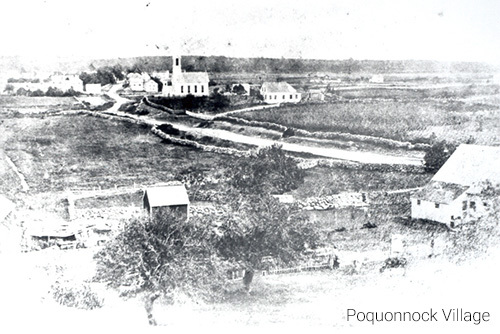 The majority of these families lived in Mystic, and it was decided to move the church to its population center. The building and the congregation united with another church nearby and became Union Baptist, Mystic. 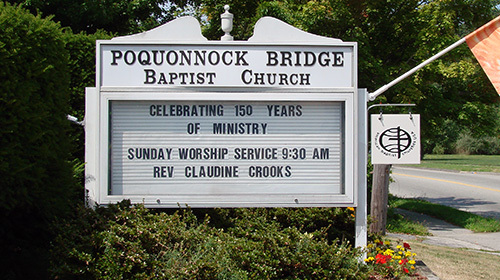 The members living in the Poquonnock area felt abandoned without a house of worship in their vicinity. Since 1830 a small group of them had been meeting as a Sunday School in the schoolhouse near the river and continued to do this after the relocation of Second Baptist. However, the constant harassment and frequent attacks upon the worshippers by a group calling themselves Infidels so annoyed them that they concluded to build their own place for worship. VOILA! PBBC! First they built a small conference house that was just in front of where the present church building is located. It was in this conference house that the group organized itself as a church in 1856. The present building was constructed in 1871 and was only the sanctuary and the vestry below. The stained glass windows were the outside wall of the church. At the time there was only one memorial window. The AVERY window was given by a descendant of one of the original settling families of Groton. The names of seven generations of Avery sons living from the mid 1600 to 1837 are listed on it. Originally it was placed in the center of the wall, but when the organ was installed in the early 1900’s it was moved to the left side. The second window was set in as a memorial to a most beloved pastor, the Reverend Osmer G. Buddington in 1926. The population explosion that hit Poquonnock Bridge during the 1940’s and 50’s was the catalyst for the building project that resulted in the Miner Education Building in 1955. At one point there were 400 students enrolled in the school with a teaching staff of forty. PBBC is no longer the only protestant church in the community and the membership has declined considerably. In 2000 the church moved to a 16 member council form of organization. The officers are: Moderator, Clerk, Treasurer, Benevolent Treasurer, and Financial Secretary. The mission of the church is generally divided into four ministries: Property and Finance, Worship and Membership, Education and Discipleship, and Mission and Outreach. Standing committees are Nominating and Hospitality. The council meets monthly and the church membership meets annually the first Sunday in February. All council meetings are open and church members are encouraged to attend. In 2016, PBBC celebrated its 160th year of service to the community. What a long and faithful journey it has been!